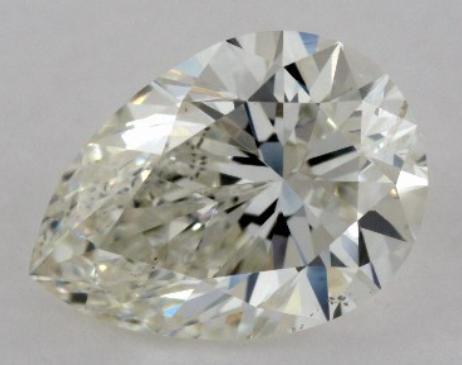 A true pear cut diamond is as scarce as it is beautiful. The length to width rations of a pear cut should work harmoniously to create a diamond that is flattering and balanced on the hand, without being stubby or poorly rounded. If you are looking for a pear cut diamond, do not expect to be spoilt for choice. This complex cut is rarely executed to perfection, so it is imperative you take the time to perform a thorough search of online inventories to find a good cut. If you’re looking for a large selection of pear cut diamonds I would recommend James Allen or Blue Nile. Do not let this put you off. Part of the magic of a pear cut diamond is in the uniqueness of its shape, and a beautiful pear cut is definitely worth the search. Some people prefer the look of an elongated pear, while others prefer a curvier shape. While much of this is down to personal taste, there are some shapes of pear that are the result of a poor, misshaped cut, and these will affect the value and beauty of the diamond. Familiarizing yourself with the guidelines below will allow you to get the best possible pear cut diamond at the best possible price. Much like a cushion cut or an oval cut, a pear cut diamond does not necessarily adhere to strict parameters when it comes to cut quality. A basic guideline would be a Depth and Table of under 66% and a Polish and Symmetry grading of ‘Very Good’ as a minimum. When it comes to assessing the true cut quality of a pear, your focus should be a good length to width ratio, and a detailed assessment by eye. The length to width ratio is calculated by dividing the total length of the stone by the width. These ratios will have a huge impact on the appearance of the stone. 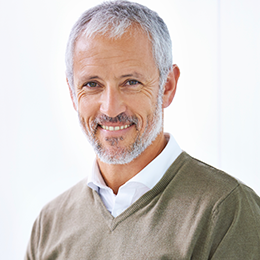 The GIA do not provide the length to width ratios on their certifications, however, they do offer the necessary measurements so you can work it out for yourself. 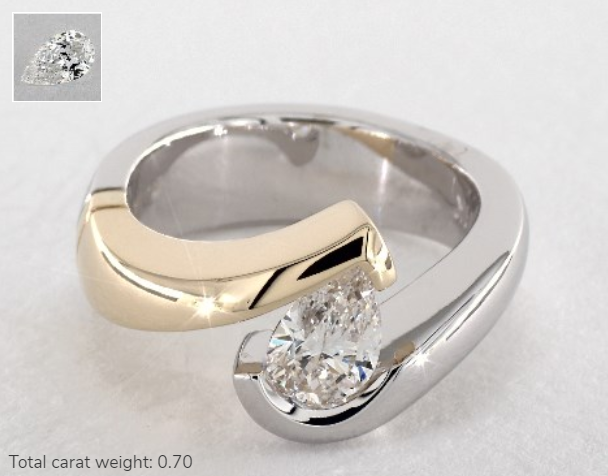 Many online vendors will also display the length to width ratios of the diamonds on their website. Most people opt for a length to width ratio of somewhere between 1.5-1.75. It’s extremely easy to work out the radio if the vendor doesn’t provide you with one already. Take this 1.02 carat I SI2 Pear Cut Loose Diamond from Whiteflash for example: The measurements provided are 8.33(l)x5.42(w)x3.68(d)mm. Below is a selection of diamonds from James Allen, who state the length to width ratio as well as the measurements of the diamond for the buyer. This diamond has a L:W ratio of 2.0. I would personally argue that there is still beauty to be had in this stone, however, the proportions are not in keeping with a classic pear shape. The appearance is overly elongated which looks a little unbalanced. 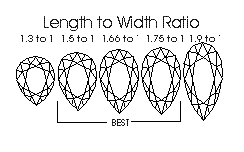 By contrast, this diamond as a L:W ratio of 1.4. 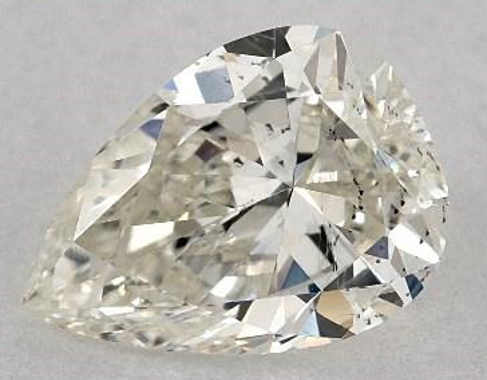 It does not have the balanced elegance of a classic pear shape; it is a little stubby and overly rounded, so the slimming properties of a pear cut diamond are lost. 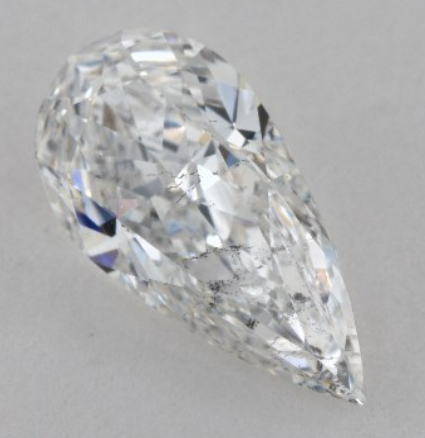 It also looks too heavy and wide for a true pear cut diamond. And finally, above we have two examples of pear cut diamonds that fall into those magic length to width ratio categories. The diamond on the left is 1.58, and the diamond on the right is 1.71. Moving anywhere on this spectrum is the best way to ensure a balanced diamond; the rest is down to personal taste. It is not only the ratios which dictate the look of a pear. There are some huge variations in the shape which can only be assessed by eye. This diamond has a length to width ratio of 1.52. Although it falls into the parameters for a well-proportioned pear, the final look is too rounded and curvy. There is not enough gradual slimming towards the top point of the pear, giving a cumbersome and overly curvy appearance. It looks thicker than it should be, as the eye is not drawn to an elegant and natural finishing point. A flat back pear does not have the beautiful oval bottom half that a classic pear cut should carry. The diamond above is a subtle, but still identifiable example of a flat back pear. You can see that the base of the diamond is not properly rounded. The subcategory below this is a triangular pear; these are easily identifiable by their entirely flat backs and slightly rounded corners. The bow-tie effect refers to an unsightly dark cast across the center of the stone. 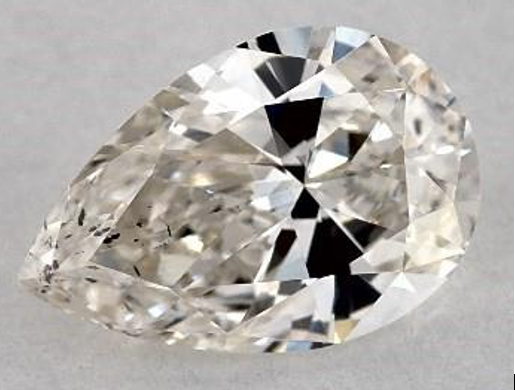 Also seen in ovals, a bow-tie greatly detracts from the beauty of the stone and is another reason why a pear cut diamond must be seen by eye rather than just relying on the proportions on a certificate. Above you can see a pear cut diamond displaying the bow-tie effect. Sometimes the effect is minimal, however, when it is prominent it will limit sparkle and distract the eye. Look for pear cut diamonds that do not display the bow tie effect. 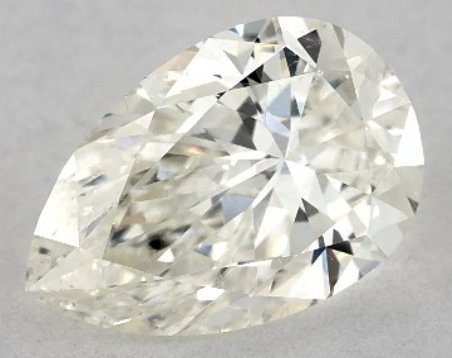 Where possible, I would advise a G in color for a pear cut diamond. Pear cuts tend to retain color and therefore are less forgiving than a round brilliant. For the best price, it is possible for find an H color diamond which will still give a colorless appearance but will cost far less than a G as it falls just outside of the ‘colorless’ grading bracket. If you are setting your diamond in a rose or yellow gold setting, you can come down to a J with little effect on the final appearance. A pear cut is excellent at concealing inclusions. It is possible to find a stunning SI1 or even SI2 for a great price that will have minimal visible imperfections. However, once again it is essential that you are able to view the stone by eye, or better still through high-res imaging (such as the examples above from James Allen). A dark inclusion towards the center of the stone will be visible and unsightly. It is all about positioning, which means getting the most for your money is all about looking at the stones thoroughly. To truly appreciate the diversity of this unique, asymmetric cut, and to determine which pear cut diamond is perfect for you, it is important to view the diamonds in a range of settings. Below are just a couple of possibilities to inspire your search. 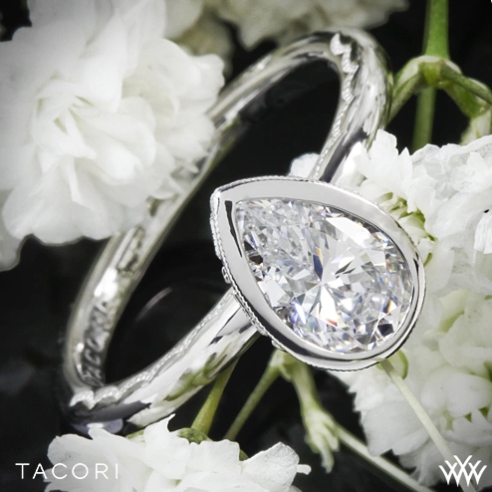 This ring from Tacori incorporates intricate metal dot-work with a bezel setting. This particular setting is a fantastic choice for an active wearer, as the metal encompasses the diamond, protecting the narrow finishing point of the stone from chipping. This James Allen tension setting present a contemporary way to wear a pear cut diamond; the angled setting perfectly complements the asymmetric aesthetic of the diamond, showing it off from all angles. Beautiful, complex, and unique. The asymmetry of a pear cut makes it unlike any other shape chosen for an engagement ring. Stunning examples of this ultra-flattering stone may be hard to come by, but when you find them they are truly something to be admired. Much of your selection will be based on trusting your eye and your instincts, therefore it is essential that you look at as many examples of pear cut diamond as possible before making a decision. Stick to the color, clarity and ratio guidelines, and let your eyes do the rest. If you need any further assistance however do not hesitate to get in touch.